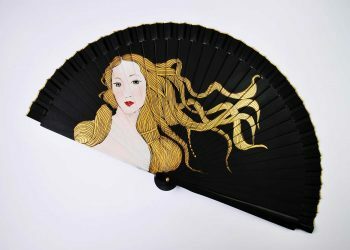 What does an illustrator painting handfans? I am passionate about handicrafts, and this has been a form of integrating crafts and illustration. Is this job so specialized? Yes, if you want to get a good result yes. First you must be a good painter, which requires a lot of training or a lot of practice and love to drawing and paiting. Then you need to know techniques as complex as serigraphy, textile design, watercolor painting applied to silk. In addition, the fan assembly process requires a very complex specialization. Is it true that the fan assembly is secret? In Valencia, which is the only place in Europe where fans are currently produced, this is a female job that goes from mothers to daughters. Is it so complex to fold a fan? Each fan has a specific folding system. In my case, I have needed several years of research and a lot of work, but with the help of a couple of engineers friendsand much practice, I managed to create my own molds to fold myself some of my fans. How can I distinguish a Spanish handmade fan between another one? Because most of the Spanish fans have a stamp on a back rod where you can read “Spanish certified fan”. How long does it take to get the fans once has been shipped? Do you send fans anywhere in the world? Can you wrap my gift order? I will send your fan inside a box and with a label that shows how it has been done, also are accompanied by its cover and wrapped in silk paper tied with a string, so are ready to be sent as a gift. If you want a special note I can do it. Can a dedication be included in the order? Of course, I can do it, and it has no additional cost. You just need to tell me by a note during the purchase process and I will bear it in mind. I need a handfan for a special date, will it be on time? Is it safe to buy at GigiHandfans? Yes. the payment method is totally safe. I use all Internet security standards, so your bank card data will be always safe and nobody will have access to it. If you have any questions about it write me. I will send it certified in order we can follow at any moment where is the package. Also, you, or someone, will be asked to sign at the reception of the parcel. This makes the delivery safer and we have the confirmation of the delivery. If there’s nobody in the address provided, it will be left in the nearest post office. Do you accept refunds of the product? I hope it does not happen and when you see the handfan you will fall in love with it 😉 , but if you are not satisfied with your purchase I accept changes and returns. In that situation, please contact me in the 4 days after reception of the package, and you will have 15 days to forward to me. Once I will receive back the fan, and if it’s in the same conditions as it was delivered, I will return your money except the shipping costs. If the fan does not arrive because the package has been lost, I will be responsible for find out what happened and claim it to the Delivery company. If it’s the company fault, I will send you another handfan. Refunds are not accepted in the case of custom products. 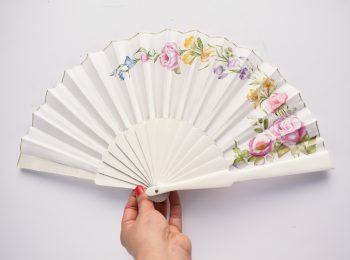 In the custom fans I will be in close contact with you, to be sure about your preferences, I will send photos of the types of fans, with the characteristics and sizes, photos of different fabrics available, even during the work process. I will very flexible with your custom order, so you could give your ok or any suggestions during the painting process. For this reason, I can’t refund this custom order unless you receive it damaged because of the transportation. 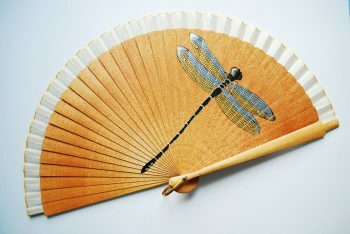 Do you have an online shop or physical store and... want to distribute my handfans? Write to GigiHandfans@gmail.com, tell us what kind of store you have, what products you sell in it, what is your philosophy and if you wish I will send you information about our products.